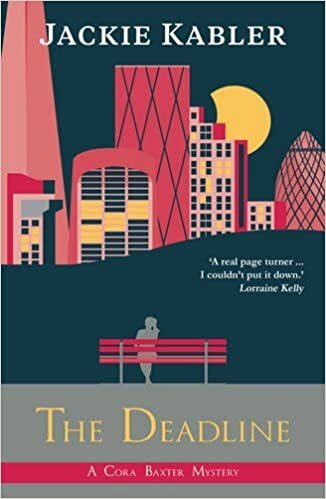 The Deadline is the second in a series of books to feature Cora Baxter but can absolutely be read as a standalone. I would recommend reading the first book though as it’s a great fun read. You can read my review of the wonderfully named The Dead Dog Day by clicking here. Don’t miss the giveaway at the bottom of this post where you can win signed copies of Jackie’s books as well as some other goodies. Cora is a TV journalist on a morning breakfast show and is used to working to tight deadlines. Now she has a very different kind of deadline. Her friend’s partner has been murdered and to everyone’s shock, her friend and colleague has been arrested and charged with the murder. No-one can believe this friend is guilty but all the evidence points to her. Cora’s boyfriend is the detective in charge of the investigation and even though he can hardly believe it either, the evidence is difficult to argue with. Cora and her friends set out to prove their friend’s innocence before her trial. It is very difficult to write a synopsis without mentioning the friend’s name but you don’t know at the beginning so I don’t want to spoil that part of the story for you. The Deadline was a very enjoyable, entertaining read. I really like the character of Cora, particularly her loyalty to her friends. Every time it seemed she had a lead which could cast doubt on her friend’s guilt, that hope was dashed. But she didn’t give up trying and refused to believe the friend she knew so well could be a murderer. There were plenty of revelations about the alleged murderer and her family throughout the book which certainly took me by surprise. Jackie Kabler has scattered red herrings and potential suspects throughout her book which kept me guessing right up to the final reveal. As usual, the person I thought was responsible had nothing to do with the murder. However, that person, along with the other suspects did have a secret of their own which made them act a bit oddly. Despite this being essentially a murder mystery, Jackie Kabler has introduced a touch of light-heartedness to the story. The exploits of Cora’s breakfast tv colleagues provided many funny moments throughout the book and I believe that they are all based on real experiences from the author’s own tv career. I will be listening carefully next time I go to a coffee shop to see if anyone order a twataccino! If I’d been drinking a coffee when I read that line, I am sure it would have been spluttered everywhere! Jackie Kabler has written another really entertaining and engaging mystery story. I’m looking forward to reading about the further adventures Cora and her friends will no doubt have in the future. Jackie Kabler worked as a newspaper reporter and then in television news for twenty years, including nearly a decade on GMTV. She later appeared on BBC and ITV News, presented a property show for Sky, hosted sports programmes on Setanta Sports News and worked as a media trainer for the Armed Forces. She is now a presenter on shopping channel QVC and has a three-book deal with Accent Press for her Cora Baxter Mysteries, a series of murder mysteries set in a television newsroom. Don’t miss this giveaway to win 2 signed copies of Jackie’s books, a Nails Inc nail polish set and a cosmetics bag. Open internationally, you can enter up to November 6th.